Et Verbum: The Life Of Fr John Gerard S.J. (A Hunted Priest) Part 13. The Life Of Fr John Gerard S.J. (A Hunted Priest) Part 13. A VISIT TO FATHER GARNET.
" I USED to visit my Superior several times a year, when I wished to consult him on matters of importance. Not only I, but all of us used to resort to him twice a year to give our half-yearly account of conscience and renew the offerings of our vows to our Lord Jesus. I always remarked that the others drew great profit from this holy custom of our Society. As for myself, to speak my mind frankly, I never found anything do me more good, or stir up my courage more to fulfil all the duties which belong to our Institute, and are required of the workmen who till the Lord's vineyard in that country. Besides experiencing great spiritual joy from the renewal itself, I found my interior strength recruited, and a new zeal kindled within me afterwards in consequence ; so that if I have not done any good, it must have come from my carelessness and thanklessness, and not from any fault of the Society, which afforded me such means and helps to perfection—means peculiar to itself and not shared by any other religious order.
" On one occasion we were all met together in the Superior's house while he yet resided in the country, and were employed in the renovation of spirit. We had had several conferences, and the Superior had given each of us some advice in private, when the question was started what we should do if the priest-hunters suddenly came upon us, seeing that there were so many of us, and there were nothing like enough hiding-places for all. We numbered then, I think, nine or ten of ours, besides other priests our friends, and some Catholics who were forced to seek concealment. The blessed Father Garnet 1 answered, 'True, we ought not all to meet together now that our number is daily increasing: however, as we are here assembled for the greater glory of God, I will be answerable for all till the renovation is over, but beyond that I will not promise.' Accordingly, on the very day of the renovation, though he had been quite unconcerned before, he earnestly warned every one to look to himself, and not to tarry without necessity, adding, 'I do not guarantee your safety any longer.' Some, hearing this, mounted their horses after dinner and rode off. Five of ours and two secular priests stayed behind.
" Next morning, about five o'clock, when Father Southwell was beginning mass, and the others and myself were at meditation, I heard a bustle at the house door. Directly • after I heard cries and oaths poured forth against the servant for refusing admittance. The fact was that four priest-hunters, or pursuivants as they are called, with drawn swords, were trying to break down the door and force an entrance. The faithful servant withstood them, otherwise we should have been all made prisoners. But by this time Father Southwell had heard the uproar, and, guessing what it meant, had at once taken off his vestments and stripped the altar; while we strove to seek out everything belonging to us, so that there might be nothing found to betray the lurking of a priest. We did not even wish to leave boots and swords lying about, which would serve to show there had been many guests, though none of them appeared. Hence many of us were anxious about our beds, which were still -warm, and only covered according to custom previous to being made. Some therefore went and turned their beds over, so that the colder part might deceive any body who put his hand in to feel. Thus while the enemy was shouting and bawling outside, and our servants were keeping the door, saying that the mistress of the house, a widow, had not yet got up, but that she was coming directly and would give them an answer, we profited by the delay to stow away ourselves and all our baggage in a cleverly-contrived hiding-place.
" At last these leopards were let in. They raged about the house, looking everywhere, and prying into the darkest corners with candles. They took four hours over the business, but failed in their search, 2 and only brought out the forbearance of the Catholics in suffering, and their own spite and obstinacy in seeking. At last they took themselves off, after getting paid, forsooth, for their trouble. So pitiful is the lot of the Catholics, that those who come with a warrant to annoy them in this or in other way, have to be paid for so doing by the suffering party instead of by the authorities who send them, as though it were not enough to endure wrong, but they must also pay for their endurance of it. When they were gone, and were now some way off, so that there was no fear of their returning, as they sometimes do, a lady came and summoned out of the den not one but many Daniels. The hiding-place was under ground, covered with water at the bottom, so that I was standing with my feet in w#ter all the time. We had there Fathers Garnet, Southwell, and Oldcorne (three future martyrs), Father Stanny and myself, two secular priests, and two or three lay gentlemen. Having thus escaped that day's danger, Father Southwell and I set off the next day together, as we had come: Father Oldcorne stayed, his dwelling or residence being not far off." Father Oldcorne's residence was Henlip House near Worcester, the seat of the Abingtons, where he and Father Garnet were discovered and captured, at the time of the Gunpowder Plot, after a search of eight days. To Father Oldcorne we return in the next chapter: our present duty is to illustrate the account of the search in Father Garnets house that Father Gerard has just given us. The house was that in which Mrs. Brooksby and Anne Vaux lived in Warwickshire, and the date was October the 15th to the 18th, 1591- As to the house > Father Gerard has already told us that Father Garnet did not come to live in London or its neighbourhood till Father Southwell was imprisoned in July 1592. The county in which he previously resided is indicated by Father Gerard in his "Narrative of the Powder Plot," 3 where he says that "Father Oldcorne and he [Father Gerard himself] met at London according to their appointment, and by good hap found the Superior [Father Garnet] then in London, though his ordinary abode were then  in Warwickshire, almost a hundred miles from London." This house was confusedly indicated to Government in "the confession of George Snape," which is signed by Justice Young. 4 - "Moreover I have heard for a truth, and I do verily persuade myself that it is so indeed, that in Warwickshire dwelleth one of the Lord Vaux his daughters, whose husband's name I marked not, and yet I think I have heard him named. She is not far distant from one Mrs. Brooks, a recusant, if I be not deceived. This Mrs. Vaux entertaineth commonly a priest or two in her house, and is resorted to by divers others, so that sometimes there are to be found in the house at one time five or six priests together. They have very safe and close places of convenience in the house for them to lurk in, as it should seem, for Mr. Hodgkins hath been there divers times and searched the house, when there hath been three or four together, and yet could find none of them. When I heard the report of this, if I had thought so much of the matter as I have done sithence, I would have informed myself more in particular of the situation and state of the house, but I took no great heed at that time to the reporter's words." The ladies were Anne Vaux and Eleanor, widow of Edward Brooksby, daughters of William third Lord Vaux by his first wife Elizabeth, daughter of John Beaumont of Gracedieu in Leicestershire, Esq. Their half-brother George Vaux left a widow with whom Father Gerard lived at a later period of his missionary life, and when he describes her position in life he says that it was in the house of her husband's sisters, " one unmarried, the other a widow," that Father Garnet lived so long. The very meeting and search at Father Garnet's residence in Warwickshire described by Father Gerard he has himself given some account of in a letter to Father Claud Aquaviva the General of the Society, which has been already printed. 5 It would however be well to place the descriptive portion of it in juxtaposition with Father Gerard's Narrative. 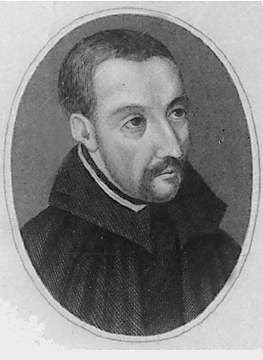 Father Christopher Grene, from whose transcript 6 it is translated, introduces this part of the letter with the words, " He then tells how they met on St. Luke's day, 1591, for the renewal of vows, and were freed from imminent peril." " That solemn meeting of ours was fixed for the three days that precede the Feast of St. Luke [October 18] . The house we had chosen for the purpose of our assembly was that which we had almost always employed on former occasions. It was the house of two sisters, one a widow, and the other a virgin, both of them illustrious for goodness and holiness, whom in my own mind I often compare to the two women who received our Lord. . . .
" Of a sudden there arrives a Queen's messenger. . . . Rosaries, chalices, sacred vestments, all other signs of piety are, with the men, thrown into a cavern ; the mistress of the house is hidden away in another hiding-place. ... On this occasion, as often enough on others when the pursuivant came, the younger sister, the unmarried one, passed herself off for the mistress of the house. . . To all the other discomforts this is to be added, that in cases like this it is necessary to contend with men who are hard to satisfy. This the young lady always did with such skill and prudence as to be able to control their pertinacity and talkativeness. She was remarkable at all times for her virginal modesty and shamefacedness, but in the cause of God and the defence of His servants the virgo became virago. She is almost always ill, but we have seen her when so weakened as to be scarce able to utter three words without pain, on the arrival of the pursuivants become so strong as to spend three or four hours in contest with them. When she has no priest in the house she feels afraid ; but the simple presence of a priest so animates her that then she makes sure that no devil has any power over her house. This was proved to be true in this cruel search in particular. . . . For, quite miraculously, one pursuivant who took into his hand a silver pyx which was used for carrying the Blessed Sacrament from place to place, straightway put it down again, as if he had never seen it. Before the eyes of another lay a precious dalmatic folded up. He unfolded everything else, but that he did not touch. I should never stop if I were to write down all the edifying things that have happened in this or other searches." 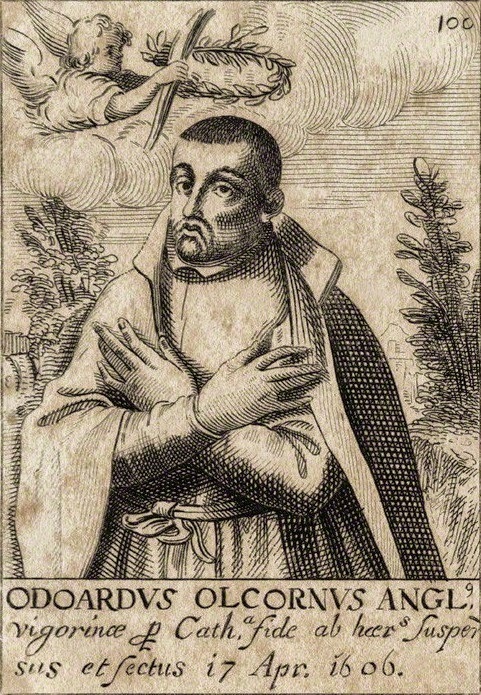 Another Father who is named by Father Gerard as present at this meeting in October 1591, and as shut up in the same hiding-place with himself, is Father Thomas Stanny. 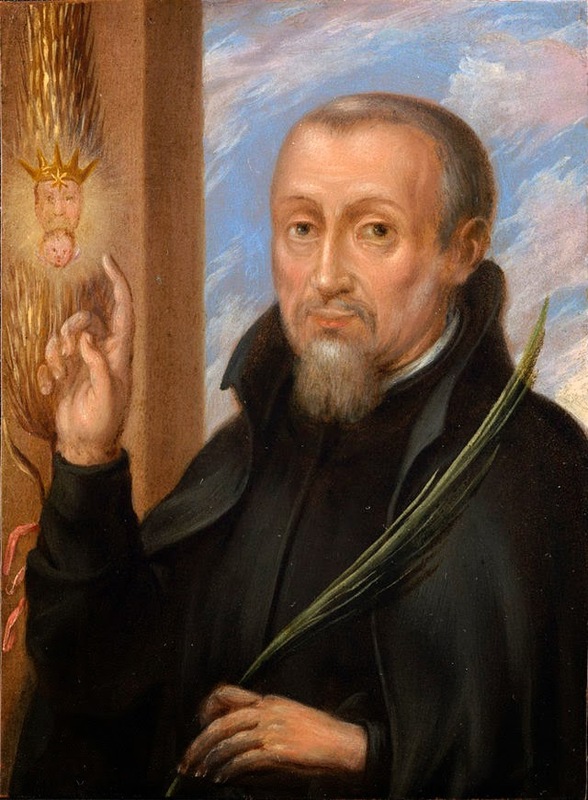 In November 1609, that is, about the time when Father Gerard wrote his autobiography, this Father wrote a " Relation about Martyrs" which is not now known to exist, but of which a few fragments are preserved for us by Father Christopher Grene. 10 He thus mentions Father Garnet, and the search at the renewal of vows in 1591. " He being sent into England, and shortly after Father Weston the Superior happening to be taken . . . blessed Father Henry Garnet succeeded him, and for the space of almost twenty years performed that office with great charity and edification ... and with great increase of the Catholic faith and benefit of our Society, for at his first coming into England he there found only one Father of our Society, but at his glorious martyrdom he left behind him above forty of our Society. . . .
" Amongst other virtues, he had special devotion unto the Blessed Sacrament, in so much that he very seldom omitted to say mass for any troubles or travels. It was his custom always during the whole Octave of Corpus Christi to reserve the most Blessed Sacrament upon the altar with great ornaments, reverence, devotion and processions. 11 And when some said unto him, ' Your Reverence should do very well to be more wary in these dangerous times/ ... he made them this most confident answer, ' God, without doubt, will both defend and protect Himself and us likewise, if we firmly trust and rely on Him.' . . .
" He had likewise a very great care that those that were not professed should, according to our rules, diligently twice a year renew their vows, which for some twelve or fourteen years he caused us to observe very exactly; although that, by reason of searching and such like troubles, divers were much against our meeting: yet his trust and confidence in God was so great that by no means he would omit it . . . but always said, ' By the grace of God I will take charge of you all until you have made your renovation, but afterwards provide for yourselves/ For which cause most of us did depart the same day, because that divers times it fell out that the very next day, when the greatest part were gone, the pursuivants came to search the house ; as twice I myself had trial thereof, when the next morning seven of us were driven to hide ourselves in secret caves under ground. At our meeting were made divers sermons, one by our Superior himself, the rest by others of our Society." Against such men a powerful Government was engaged in a war of extermination, and false brethren were found to betray them. In the following year James Young alias George Dingley, alias Thomas Christopher, the poor priest with whom we have already made acquaintance, made the following offer 12 to Lord Keeper Puckering. " This term time divers priests will be in London, and as I think Garnet the Jesuit will also be here, or some other of the chief of them, with whom I should haply meet abroad and covertly give your honour to understand of them, that therein also your lordship may have experience of my sincere meaning and desire to requite in some sort her Majesty's most princely favour and your honour s bounty towards me. Thus wearied with irksome imprisonment, yet content with your lordship's determination, I commend your lordship to the safe tuition of Almighty God. From my prison this 30th October, 1592 ." 1 When this was written, the strict laws of Urban VIII. had not yet been made, which forbid the introduction of any public religious veneration except by the authority of the Holy See. 2 Defecerunt scrutantes scrutinio.—MS. Psalm lxiii. 7. 3 Condition of Catholics, p. 282. 4 P.R.O., Domestic, Elizabeth, vol. ccxxix. n. 78; dated in the Calendar 1589. 5 Troubles, First Series, p. 149. 6 Stonyhurst MSS., Father Grene's Collectan. P., f. 556. 7 P.R.O., Domestic, Elizabeth, vol. cexxx. n. 104. 9 Father Southwell has written this as an introduction to two different letters bearing the same date, one of which refers to the other, in which he has described the martyrdom of Bales and Horner. 10 Stonyhurst MSS., Father Grene's Collectan. P., f. 581. 11 See Troubles, Second Series, p. 144. 12 P.R.O., Domestic, Elizabeth, vol. ccxliii. n. 50.